The prostate cancer (PC) cells of origin are the basal epithelial cells, however, the nature of signals inducing their transformation is still unclear. Development and function of prostate epithelium are regulated by signals from the tissue specific stromal cells. In this study the tissues from prostate cancer or surrounding normal tissue from patients subjected to radical prostatectomy were cut, treated by collagenase, and cultured in petri dishes in special SCBM medium. During first 3-4 weeks the primary cultures of prostate tissues consisted of growing islands of polygonal cells tightly adhered to each other and plastic. Passaging of the cells did not change their appearance. We did not observe at this stage of prostate culture any mesenchymal cells which appeared in three-four weeks and gradually formed clones of fibroblast-like cells possessing clonal abilities. On third-fourth passages these cells formed homogenous stromal population and expressed mesenchymal CD44, CD73, CD105, but not CD34 or CD45 markers. Histological analysis of PC tissues revealed hyperplasia of transformed epithelium and destruction of basal layer. Using PCR technique we found that expression of basal cell markers E-cadherin and cytokeratin 5 was diminished whereas expression of AMACR was enhanced. Increased level of AMACR protein was detected in PC tissues in immunoblot but not being revealed in normal tissue. Induced production of AMACR mRNA and protein we registered was the most diagnostically valuable with testing of not fractionated PC tissue. 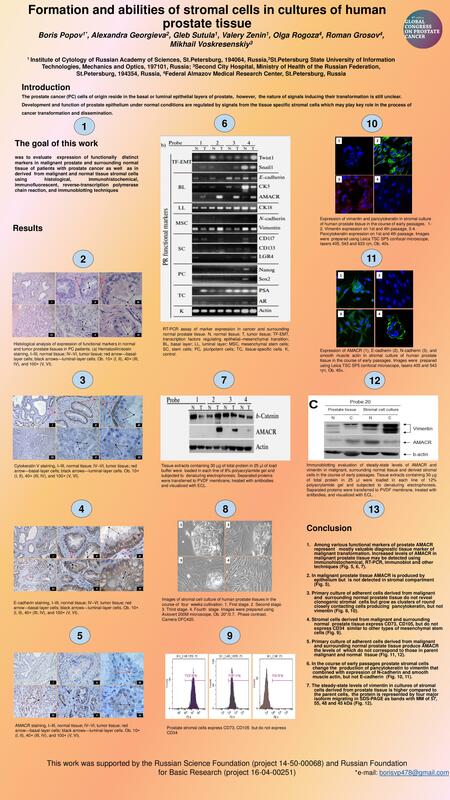 Expression of AMACR and vimentin in culture of prostate stromal cells was significantly increased compared to the parental tissues. Vimentin was produced in several 43-60 kD isoforms with various expression pattern in different patients. Our results suggest that prostate stromal cells possessing clonal abilities may originate in culture from nonstromal progenitors. 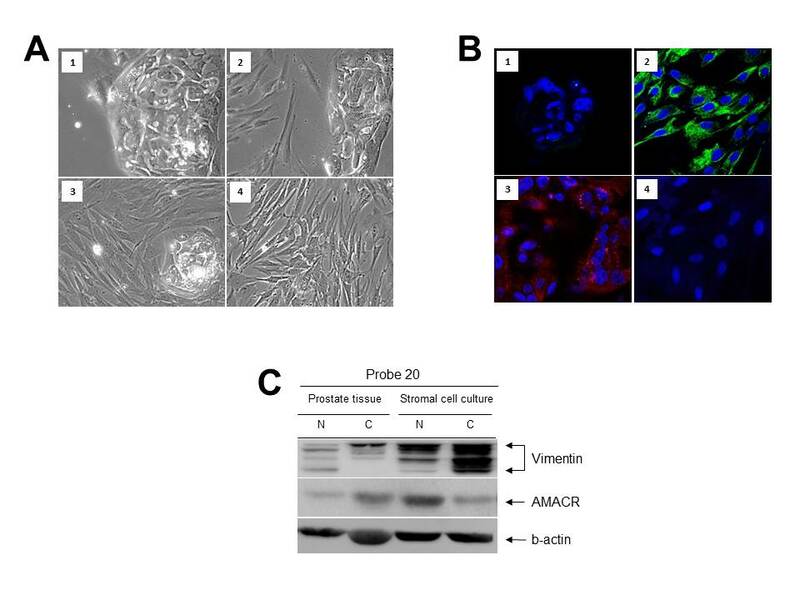 AMACR and vimentin expression are upregulated in culture of the prostate stromal cells. The further study of this phenomenon may reveal its biological and medical significance. This work was supported by the Russian Science Foundation (project 14-50-00068) and Russian Foundation for Basic Research (project 16-04-00251).